August | 2011 | Always On! I’ve also learned – much against my nature – to be optimistic. 30% chance of rain, as my friend Gary pointed out, means 70% chance that it won’t rain. 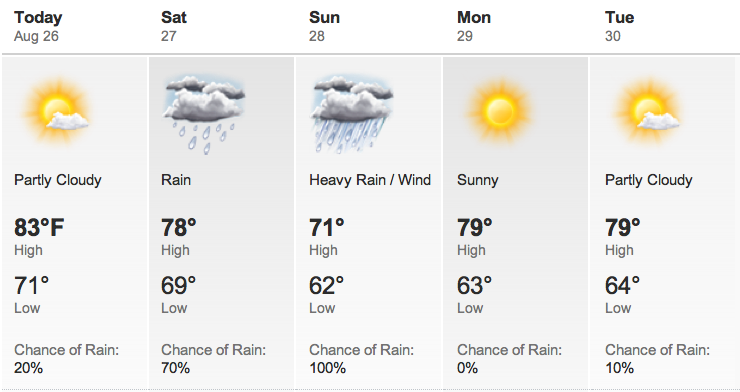 So where does this leave me on the eve of Hurricane Irene’s visit to the Northeast corridor? Unfortunately or fortunately, I feel skeptical. 100% chance of rain on Sunday has, in fact, compelled me to cancel my plans to go to the US Open to watch the players practice, and has motivated me to select an indoor venue for my birthday dinner – despite my publicly stated summer birthday policy. However, 4-11% chance of a hurricane and 72% chance of tropical storm conditions has not “at this point in time” deterred me from going forward with said birthday plans, or inspired me to give up my prime parking spot to return my car to the garage. I hear warnings and forecasts on New York One and from friends and family on Facebook – including one in Hong Kong, who implores me not to underestimate the storm. But I look at the maps and zones and am not convinced. Nor are my porter and doorman. So, I’ve decided to be a weather optimist – at least for the moment. This is not meant to be a recommendation for others in more precarious situations, and, well is subject to change, but I’m curious to see how this weekend unfolds… so much so that I’ll surely be closely connected to my weather.com app – at least until the cell towers get knocked out and I run out of power….